The Chinook Winds and Cascade Quartet get together for their annual collaborative chamber concert, "Complementary Colors". 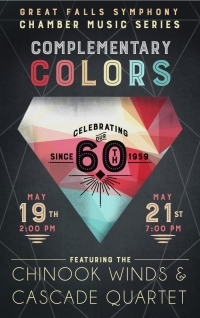 These two Core Ensembles of the Great Falls Symphony will present a variety of works that combine distinctive timbres and colors from the string and wind families. Don't miss this unique program, the grand finale of the 2018-2019 Chamber Music Series!